If only all customer service conversations were this informative. Posting screen grabs from a live chat with a purported Asus customer service representative to Google+, a user may have recently outed the specs we can expect from the next Nexus 7. The effusive rep, seemingly wanting to do right by an eager customer, noted that the specifications he/she provided weren't confirmed, though they were "Internal Specs." 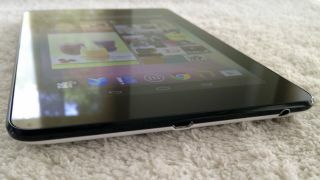 Many line up with what we've heard about the follow-up Android tablet before. In the latest leak, the 7-inch LED display is said to have a resolution of 1980 x 1200, a jump from the current model's 1280 x 800 screen. Again we hear that the CPU will turn into a Snapdragon from a Tegra, specifically a quad-core 600. RAM is chalked at 2GB, up from 1GB, and internal storage, according to the rep, is 32GB. There's no mention of other storage sizes. The Asus employee points to a new 5MP camera on the back with the same 1.2MP snapper on the front. However, the battery is actually down from 4,325mAh in the current model to 4,000mAh in this one, and it comes with an unspecified Wi-Fi, Bluetooth 4.0 and NFC. LTE does light up in this version. Last but not least, the rep noted that the next Nexus' OS is indeed Android 4.3, which we've certainly heard before. Of course, all of this should be taken with some salt (salty jelly beans, anyone?) as there's been no official word that a new Nexus 7 is even in the works. Until we get the company word, may we suggest an employee review of non-disclosure policies? Just saying. The next Nexus is still a mystery, as are Google's plans for a video game console, smartwatch and new Nexus Q.